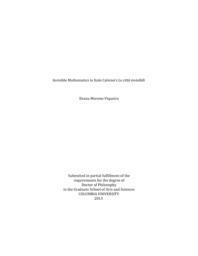 This dissertation examines the use of mathematical concepts as an essential structural and thematic element in Italo Calvino's Le città invisibili. The author`s conception of literature as a combinatorial art, intrinsically mathematical itself, is the point of departure. Focal to the study is Calvino's interest in that which is an essential part of the combinatorial game and the key to Gödel Incompleteness Theory, namely, the elements of surprise and the unexpected - the exceptions to the rule. Other critical approaches to Calvino's work, like semiotic, structuralism and scientific are interrelated to Mathematics, but what this study proposes is a strictly mathematical approach to complement that which has already been pointed out. A mathematical perspective based on an understanding of Mathematics as more than just numbers encompasses the whole analysis. Mathematics is given its proper place as a humanistic discipline. It is an interdisciplinary proposal of literature and science, pertinent to Calvino's writing. The purpose is to unveil a "hidden math" which from the perspective of this study is an intrinsic tool in Calvino's writing process of Città. As a versatile writer, Calvino manages to use mathematics in such subtle ways that it may not be perceptible at first sight. Most importantly, within these mathematical concepts and images lies, in part, the potential character of literature for which the author aims: that latent yet invisible possibility, that search for new forms (like the cities). These ideas, particularly related to potential literature, are also analyzed from his interest and involvement in Oulipo (Ouvroir de Littérature Potentielle). The study begins by unfolding what aspects of combinatorial mathematics are present in Le città invisibili; how these concepts as well as other images are used in the construction and design of the cities and the book; and to find out why Calvino finds recourse to mathematics as a narrative and creative strategy. Calvino's use of mathematical concepts are studied as a "visual instrument" in the organization and construction of his imaginative writing and, furthermore, as a means to achieve "lightness" structurally and thematically through the abstract, aesthetic and, at times, even humorous nature of mathematics. In their own way mathematics and literature attempt to make visible what is invisible, and they both struggle to remove weight from their own "systems" of expression. In conclusion, the investigation intends to demonstrate through Calvino's Le città invisibili, how mathematics and literature complement each other in the search for new forms, new ideas, new stories.